Why are Letters from the Past Important? 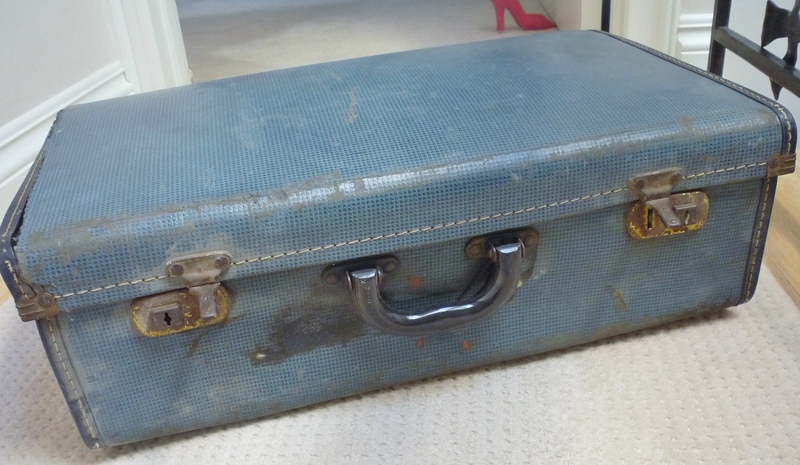 After my parents died, I sorted through the worn blue suitcase, my mother carried with her from England so many years earlier. Snapping open the two metal clips, I lifted the lid. Neatly wrapped in plastic bags, the contents were in good condition. I flipped through pages of diaries, my father’s army discharge papers from WWII and telegrams celebrating departures, arrivals, births and deaths. Then I pulled out dozens of letters my parents wrote to each other when my father worked in Chicago for eight months during 1948. I carefully removed the musty airmail paper from ripped envelopes, reading perfectly preserved hand written words from the still crisp blue pages. 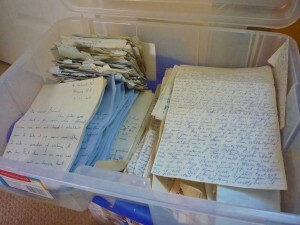 My mother wrote her letters in blue ink, every line neatly spaced. All are dated and filled with descriptions of people and events from the past. What a legacy they left! Correspondences are just some of the items you can use in genealogy research. So where should you begin? The best place to start is with parents, aunts, uncles and older cousins. Their recollection of names, places and events may vary, nevertheless every piece of information counts when compiling information. Engage in casual conversation and record it; it’s much easier to extract pertinent facts from recordings later on than figure out hand written details. Find out where ancestors are buried. Cemeteries can provide a treasure-trove of information carved on a stone or from the records administrators are required to keep. When you begin searching on websites or requesting information from archives in other countries, bear in mind that surname spellings may differ slightly from what you may have been told. Avoid running specific name searches, allow for variations. Dropping the first name can also be helpful in an initial search. Remember; just because your ancestors lived in one town or village their entire life does not necessarily mean they were born there! Be flexible in your searches. Translate letters into local dialects when writing to local archives and other institutions. Be patient, it can take several months before you may get a response. Don’t get disheartened when you hit a dead end; we all do! Giving your search a rest, returning a few days or weeks later with a fresh approach can help propel your journey forward. Genealogy research is detective work; however when you discover information about your ancestors the rewards can be exhilarating! So what am I doing with the letters in the blue suitcase? They’re the inspiration for my next book!